HEAVY earth removers and bull­dozers have been busy this week making a start on a project that may well make the small village of Cosgrove the holiday haunt of thousands of Midland folk. 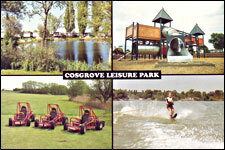 If the planners approve Cosgrove Lodge Park is to open next April as a recreational centre and holiday caravan site offering such facilities as fishing, sailing, power boating, water skiing and swimming. it is now some two years since Cosgrove Lodge with 110 acres of old gravel pits came on to the market. At a Northampton auction sale it went to Mr. J. H. White of Barton Hartshorn Manor, Bucks, for £7,300. Since then outline planning permission has been given for a country club with sailing, fishing, and sites for caravans. With these permissions the Lodge was resold last July for a widely quoted figure of £35,000. 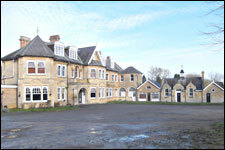 The present owners are Cosgrove Lodge Ltd., of which Mr. Peter Clarke (26) Is a director and the estate manager. His co-directors are his parents, Mr. and Mrs. H. Clarke and his brother-in-law and sister, Mr. and Mrs. W. Hayward. His father is a retired builder and Mr. Hayward is senior lecturer in building at Coventry Technical College. Mr. Clarke himself is a civil engineer with experience on the Sheffield-Leeds motorway design, the Doncaster by-pass construction, the building of an atomic energy research establishment in Dorset and a new power station at Birmingham. The family are carrying out most of the work themselves with hired machinery and as the bulldozers roared away levelling sites and making a new entrance road on Tuesday Mr. Clarke talked to the “Express” about his plans. Details of his schemes are now before the Towcester Rural District Council and include as a first stage a three-acre lakeside site for 75 holiday caravans. 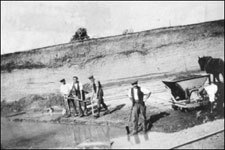 Sewers will be laid, toilet blocks and refreshment shops erected and nearby, using part of an old excavation, a concrete open air heated swimming pool is to be built. If the plans are approved all this work will be done by next May. A new access road, parallel with the track leading to Cosgrove canal locks, is being cut across the field in front of the house to enable caravans to pass in safety. If there is a demand, planning approval will be sought to extend the sites to cater for 300 caravans. Forty of the 110 acres are lakes and these will be utilised to the full. The largest of 22 acres will be for power boating and water skiing. Two more will be joined together for sailing boats. There will also be water for rowing and a small shallow pit will be reserved as a boating pool for children, with swings and other amusements nearby. Much local interest of course Is centred around the future of the Lodge itself, popularly known as Branson’s House, or Branson’s Folly, built by a newly rich man, George Frederick Branson in 1898. People still talk of his fabulous extravagance, his generosity, his drinking and his all night parties. Asked what is to happen to this large house, Mr. Clarke replied that consultants have been engaged to see if it would be worth while turning it into a high class restaurant with motel accommodation. What about the cost of the project? “By when we open in April we shall have spent about £50,000, including the purchase price,” said Mr. Clarke.